With lush tropical rainforests, steep volcanic terrain, and abundant annual rainfall, Maui offers some fantastic waterfall hiking opportunities. The tours on this page offer you a chance to go experience this beauty through the eyes of a professional guide ... you will see more and understand more than going it alone! 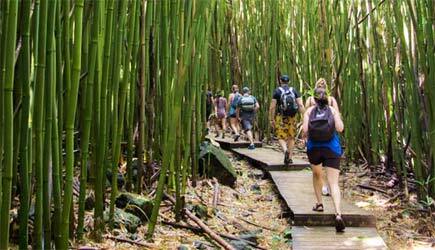 The first three tours all offer varying levels of hiking in waterfall areas, while the fourth tour features the rugged and lunar-like landscape of Haleakala, Maui's 10,000 foot tall volcano. 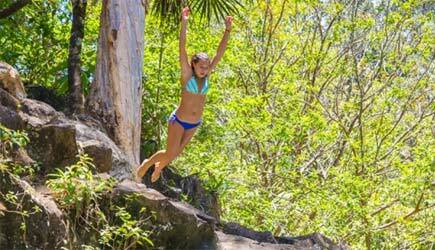 She's jumping into this emerald waterfall pool! This is the most popular hike, which takes place in a unique valley with a variety of waterfalls ranging in height from 10 to 40 feet on two different streams. There are large, clear swimming holes under each of the falls. Adding to your adventure, there are several spots where you can jump safely from rock ledges into the waterfall pools below, which makes a fantastic photo opportunity. Learn about Maui's wonders from the naturalist guides, and end the hike with a natural "shower" under a Hawaiian waterfall. The largest of these falls has ferns that hang down from a huge overhanging ledge, and you can walk completely behind the falls! A backpack, rain gear, and bug repellent are provided; water, snacks, and lunch are served on this tour. Meeting Point: Meet your guide at the county Park-n-Ride lot in Kahului. Complimentary pick up is also available at Kahului Harbor for Pride of America guests. Pickup from South Shore and West Side hotels is available for $30 per person for those without rental cars. 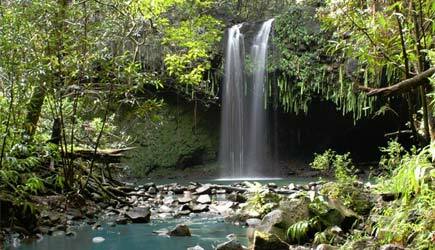 Enjoy two waterfalls on a shorter one-mile walk in the lower portion of this beautiful rainforest valley. 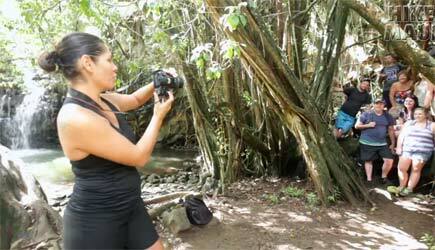 This is the shorter version of the popular East Maui Waterfall Hike; perfect if you have limited time, don't want to walk TOO far, or have younger children. 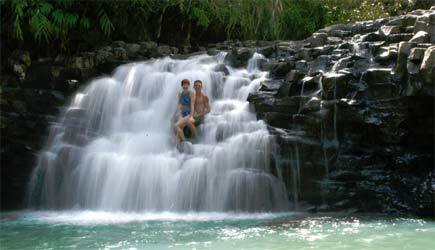 You may swim under 10 and 20 foot waterfalls and jump off rock ledges into the waterfall pools if you are really adventurous! A backpack, rain gear, and bug repellent are provided; water and snacks are served on this tour. The top of 400 foot Waimoku Falls. No swimming allowed here! Minimum age for this tour is 8. 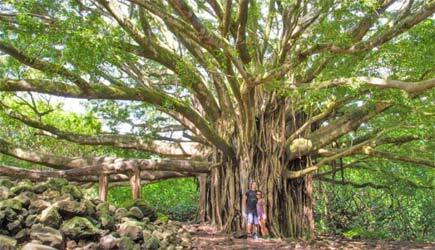 This full-day excursion completely circles the east side of Maui on the way to and from the day's premier hiking stop at Oheo Gulch. 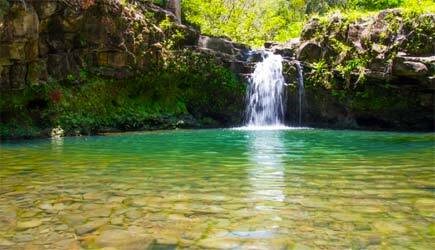 This area is known as "The 7 Sacred Pools" but as you hike about the area that most tourists go, you'll discover there's a lot more than 7 pools! You'll enjoy a hike through bamboo forests with views of many smaller waterfalls, one 200 foot waterfall, and the highlight is standing near the bottom of 400' Waimoku Falls! 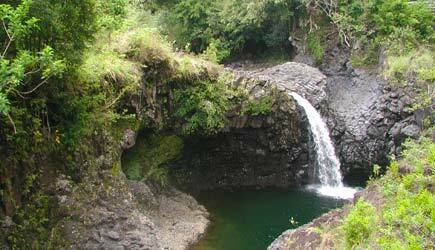 You will also experience a variety of waterfall and ocean overlooks on the scenic "Road to Hana" and beyond. This is a long, epic day you will remember forever. A backpack, rain gear, and bug repellent are provided; water, snacks, and lunch are served on this tour. Meeting Point: This tour includes complimentary pickup at most Maui hotels. For those staying outside of the pickup area, meet your guide at the county Park-n-Ride lot in Central Maui. 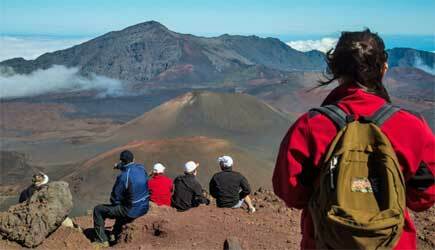 No Maui vacation would be complete without viewing the magnificence of Haleakala Crater. From the 10,000 foot summit the views of the Big Island, West Maui, Molokini, Kahoolawe, Lanai, and Molokai are astounding. Haleakala is a dormant volcano, but activity here was recent enough that the landscape is otherworldly. On this hiking tour into Haleakala Crater you will experience two different trails at two different elevations with completely different environments. The first trail starts at the summit and you'll hike for two miles ... past huge cinder cones which have partially filled in the erosional valley that forms Haleakala's large "crater." 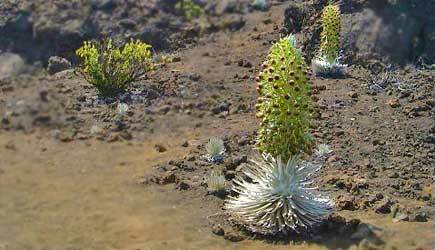 The second trail is at the 8,000 foot elevation and you will hike for two miles on a lava lined trail with rare native plant species. 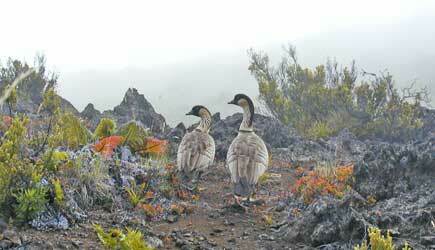 Sightings of Hawaii's state bird, the Nene, are frequent in this area. A backpack, rain gear, and bug repellent are provided; water, snacks, and lunch are served on this tour. Completely closed-toed shoes are required due to volcanic cinders. No Tevas, sandals, crocs, etc. Meeting Point:This tour includes complimentary pickup at most Maui hotels. For those staying outside of the pickup area, meet your guide at the county Park-n-Ride lot in Central Maui. NCL cruise ship passengers in Kahului are able to do either the East Maui Waterfall Hike or the Short Waterfall Walk or the Haleakala Crater Hike on either their first or second day in port. Pickup will be at the Maui Mall, which is a short walk from Kahului Harbor. 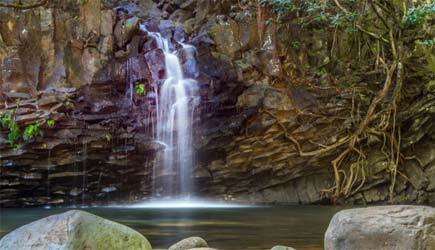 The Hana Waterfall Hike is the only one of these tours that doesn't fit your itinerary. I am often asked "why go on a hiking tour? Can't I just go and experience the same thing on my own?" The answer to that question is a definitive "no." You could walk down the same trail on your own, and your experience will be completely different. The presence of a knowledgable local guide who loves the "aina" (land) can make all the difference in your understanding and appreciation of everything that you see. You'll learn about plants that have uses that you never imagined. You'll taste fruits that are foreign to you. You'll learn of history and geology of the area that offers insight you wouldn't get going there alone. Hike Maui, the company that organizes these tours, likes to refer to their guides as "the secret ingredient for your experience." Obviously a guide also knows exactly where these places are so your day in the magical rainforest or volcanic landscape is maximized. 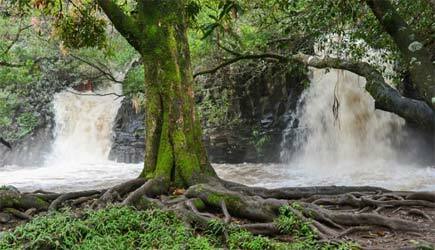 No hunting for that elusive waterfall ... you'll go straight there and have more time to soak it all in. A guide who knows the "aina" will help keep you safe, and provide support if you need it. Would you like to jump off a cliff into a waterfall pool below? Doesn't it sound like a good idea to have a guide who can tell you where it is safe to jump and where there a rocks hiding below the surface??? If you have the time and are up for a longer hike with more elevation gain, the Hana Waterfall Hike is a fantastic day! This is a long day with a lot of riding ... the drive to and from the trailhead is 2.5 hours each way with lots of twists and turns and curves and one lane bridges and miles of rugged roads on the back side of Haleakala. 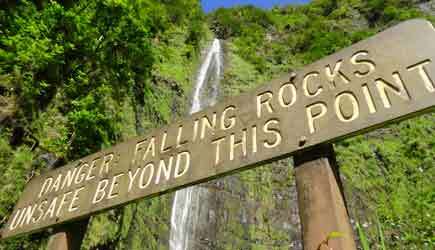 When you are standing near the bottom of 400' Waimoku Falls you'll agree it was all worth it! 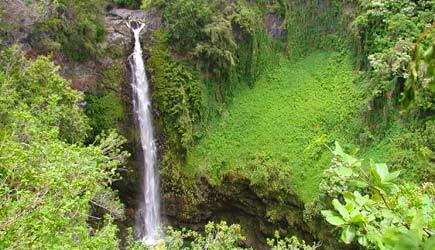 The East Maui Waterfall Hike is the most popular tour. This is the event that will truly make you glad you had a guide with you. As you hike through an "off-the-grid" farming area you'll taste fruit you've maybe never seen before. Your guide will impress you with his or her ability to take plants from the jungle and demonstrate uses you've never thought of. You'll probably learn what a tapioca plant looks like (yes, it comes from a plant ... not from a jar with the Gerber Baby on it). 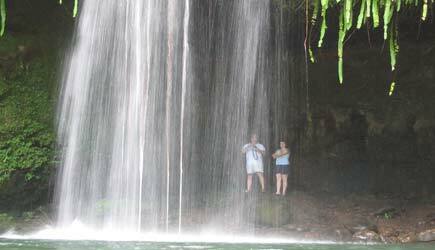 For those who want to get out in the jungle but aren't up for a longer hike, the Short Waterfall Walk is perfect ...especially for multi-generational groups where grandma wants to take pictures of the grandkids jumping from waterfalls. The walking is easy and the distance is short. And you'll see waterfalls that other people who aren't with a guide will completely miss! 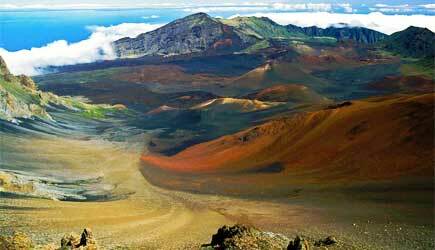 The Haleakala Crater Hike is in a category all its own. 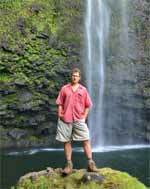 While most people think of Maui hiking centered around waterfalls, this hike is centered around a volcanic landscape that is often compared to that of the moon (or Mars). 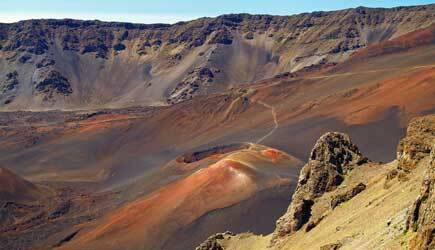 As a matter of fact, Haleakala was the backdrop for one of the final Mars scenes in the movie "Total Recall." One thing to keep in mind for this tour ... due to its elevation the air is much cooler. You are going to want to dress in layers for this one, keeping in mind that the air temperature can vary widely on this tour and daytime temperatures at 10,000 feet are often in the high 40's to low 50's. 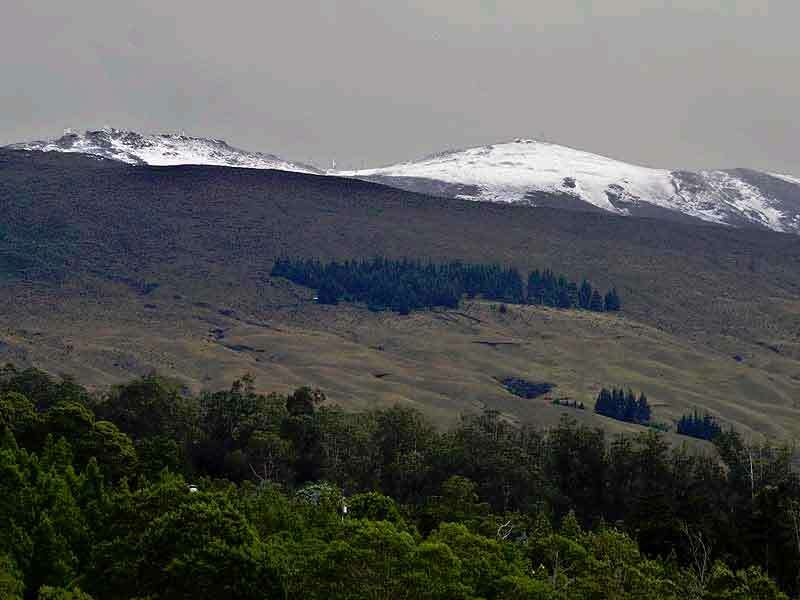 Yes, once every three or four years the summit of Haleakala even gets a light dusting of snow. Don't believe me? Check out this snowy photo of Haleakala I took from my driveway in Upper Kula. This photo actually made the front page of a Honolulu newspaper and made the rounds in the national news! 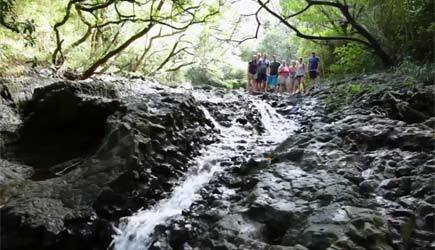 If you are really into hiking, you might consider doing two of these tours ... either the Hana Waterfall Hike or the East Maui Waterfall Hike on one day paired with the Haleakala Crater Hike on another. A word about gratuities ... it is traditional for guides in such a service industry to rely on gratuities for a significant portion of their income. This time-honored tradition promotes excellence in service and you might want to bring along cash in case you want to express your appreciation to your guide in this way. Please note that for larger parties of 7-10 people this tour operator asks us to include a $150 gratuity for guides in our billing for your tour. Pickup is free at Park and Ride and Kahului Harbor. Resort pickup is free for Hana and Haleakala tours. 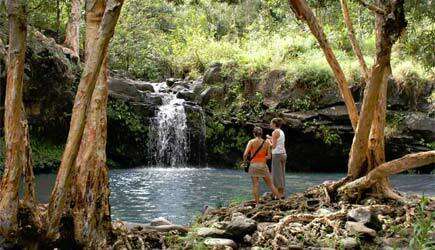 Add $30 per person for resort pickup for East Maui and Short Waterfall tours. Kahului Harbor pickup is only available for cruise ship passengers and only on East Maui and Short Waterfall tours.